In 1742 Paul Jacques Malouin gave a presentation to the Académie Royale des Sciences in which he described a method of protecting iron from corrosion, by way of dipping it into molten zinc. Over the next 60 years, Luigi Galvani and Alessandro Volta’s studies of electricity suggested that something mysterious was happening when dissimilar metals were immersed in an electrolyte. By 1824, Sir Humphry Davy had shown the British Navy that zinc anodes would prevent the corrosion of copper (and later steel) ship hulls. He showed both in laboratory and field tests that the zinc was consumed sacrificially, in favour of the more noble metals. This is the process of cathodic protection. Twelve years later in 1836, Stanislas Sorel began filing patents for coating cleaned steel in molten zinc. The galvanizing industry was born. Fast forward to the present day and hot dip galvanizing is used all over the world to protect steel from corrosion. In marine environments, industrial situations, infrastructure projects, the automotive industry, fastenings, commercial buildings, architectural applications and even the household washing-line pole - hot dip galvanizing is used wherever low maintenance, long-term durability and reliable protection are required. After over 180 years of use and study, hot dip galvanizing’s ability to protect steel in various environments is well understood. When used in the appropriate environments, its performance is extremely well-documented, reliable and predictable. Hot dip galvanizing standards are quoted the world over in building codes, government infrastructure legislation and best-practice documents. 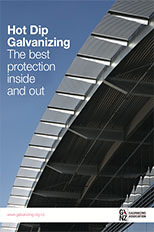 No other coating is as well researched and none is as trusted as hot dip galvanizing. Worldwide, approximately half of all steel production goes to replacing rusted steel. 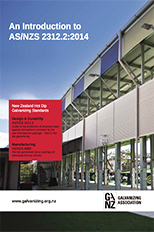 The Galvanizing Association of New Zealand (GANZ) represents New Zealand’s leading hot dip galvanizing companies. With our associates, we provide information about hot dip galvanizing and its applications, as well as design information and technical resources. Through our associate membership of the Galvanizer’s Association of Australia (GAA), we have access to the Life Cycle Cost Calculator and many technical documents that we can use to provide impartial, verifiable information to our members and their customers. The Design for Galvanizing tab at the top of this page links to a wealth of information about hot dip galvanizing. If you cannot find the answers to your questions there, please email us. Choosing a corrosion protection system is a critical step in the design of any project and the life-cycle cost of corrosion-related maintenance is typically two- to five-times the initial cost. The Galvanizers Association of Australia has developed a new micro-site to allow users to calculate the initial and total life costs of 30+ other corrosion protection systems against hot dip galvanized steel. Based on the information you provide, the Life-Cycle Cost Calculator (LCCC) will generate a customised report detailing all costs associated with maintaining the structure over the desired project service life, including the time value of money. You can access the Life Cycle Cost Calculator here. More information on Life Cycle Costing of hot dip galvanized coatings, including the sustainable features of the process, is available from GANZ.